How to Get a Quote? Premium Custom Preterminated Fiber Optic Assemblies and Ethernet Cables manufactured in the USA since 1997! The QuickTreX® 62.5/125 LC to LC OM1 Multimode fiber optic cable assemblies are made to order in the USA and are fully tested to guarantee top performance. Each assembly is serialized for easy identification and sealed in individual Ziploc bags. Test results are included in each order.They are constructed with the highest quality components utilizing Genuine Corning ClearCurve Glass and High Grade Connectors with ceramic ferrules for increased durability and accuracy. Picture sending signals zipping along from one location to another in the form of light guided through thin fibers of glass or plastic. These signals can be analog or digital - voice, data or video information and fiber can transport more information longer distances in less time than any copper wire. It's powerful and fast, fast, fast! Metric System: Fiber Optics, as a universal technology, utilizes the metric system as the standard form of measurement. Meter: 3.28 Feet (3.28084 ft. to be precise). Kilometer: 1000 meters / 3,281 feet / 0.62 miles. Micron: 1/1,000,000th of a meter. 25 microns equal 0.001 inch. This is the common term of measurement for fibers. Nanometer: One billionth of one meter. This term is commonly used in the fiber optics industry to express wavelength or frequency of transmitted light. Optical Fiber: Thin strands of highly transparent glass or sometimes plastic that guide light. 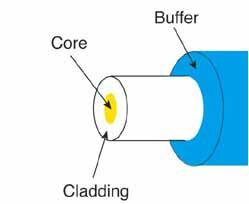 Core: The center of the fiber where the light is transmitted. Cladding: The outside optical layer of the fiber that traps the light in the core and guides it along - even through curves. Buffer coating or primary coating: A hard plastic coating on the outside of the fiber that protects the glass from moisture or physical damage. Mode: A single electromagnetic field pattern (think of a ray of light) that travels in fiber. Multimode fiber: has a bigger core (almost always 62.5 microns - a micron is one one millionth of a meter - but sometimes 50 microns) and is used with LED sources at wavelengths of 850 and 1300 nm for short distance, lower speed networks like LANs. Singlemode fiber: has a much smaller core, only about 9 microns, and is used for telephony and CATV with laser sources at 1300 and 1550 nm. It can go very long distances at very high speeds. Both multimode and singlemode fiber have an outside diameter of 125 microns - about 5 thousandths of an inch - just slightly larger than a human hair. For more on optical fiber, go here. Cable: Fiber needs protection to survive all the places it gets installed and it's the cable that provides it. Cables may have from one to hundreds of fibers inside. Jacket: The tough outer covering on the cable. Cables installed inside buildings must meet fire codes by using special jacketing materials. Strength members: Aramid fibers (Kevlar is the duPont trade name) used to pull the cable. The term is also used for the fiberglass rod in some cables used to stiffen it to prevent kinking. Armor: Discourages rodents from chewing through it. Go here for more on cables. Fusion Splicer: An instrument that splices fibers by fusing or welding them, typically by electrical arc. Hardware: Terminations and Splices require hardware for protection and management: patch panels, splice closures, etc. Attenuation: The reduction in optical power as it passes along a fiber, usually expressed in decibels (dB). See optical loss. Bandwidth: The range of signal frequencies or bit rate within which a fiber optic component, link or network will operate. Decibels (dB): A unit of measurement of optical power which indicates relative power. A -10 dB means a reduction in power by 10 times, -20 dB means another 10 times or 10 times overall, -30 means another 10 times or 1000 times overall and so on. Micron (m): A unit of measure used to measure wavelength of light. Nanometer (nm): A unit of measure used to measure the wavelength of light (meaning one one-billilonth of a meter). Optical Loss: The amount of optical power lost as light is transmitted through fiber, splices, couplers, etc, expressed in dB. Optical Power: is measured in "dBm", or decibels referenced to one miliwatt of power. while loss is a relative reading, optical power is an absolute measurement, referenced to standards. 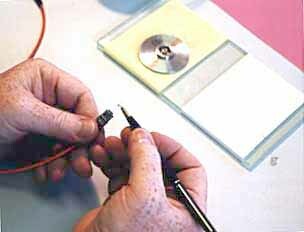 You measure absolute power to test transmitters or receivers and relative power to test loss. Wavelength: A term for the color of light, usually expressed in nanometers (nm) or microns (m). Fiber is mostly used in the infrared region where the light is invisible to the human eye. Go here for more information on testing. Fiber Stripper: A precise stripper used to remove the buffer coating of the fiber itself for termination. There at three types in common use, called by their trade names: "Miller Stripper", "No-Nik" and "Micro Strip." Cleaver: A tool that precisely "breaks" the fiber to produce a flat end for polishing or splicing. Scribe: A hard, sharp tool that scratches the fiber to allow cleaving. Polishing Puck: for connectors that require polishing, the puck holds the connector in proper alignment to the polishing film. Polishing Film: Fine grit film used to polish the end of the connector ferrule. Crimper: A tool that crimps the connector to the aramid fibers in the cable to add mechanical strength. Here is more information on termination. Reference Test Cables: short, single fiber cables with connectors on both ends, used to test unknown cables. Mating Adapter: also called splice bushing or couplers, allow two cables with connectors to mate. Visual Fault Locator: A device that allows visual tracing and testing of continuity. Microscope: used to inspect the end surface of a connector for flaws or dirt.